It’s become clear over the past few months that Sen. Mark Pryor (D-AR), despite the increasing Republican lean of his state, has been holding his own, or better, against Rep. Tom Cotton (R, AR-4). Several positive polls for the incumbent, including a too-optimistic 11-point lead from NBC/Marist earlier this week, moved the HuffPost Pollster average in the race to 45.2% Pryor, 42.7% Cotton. Democrats are defending seven Senate seats in states that Mitt Romney won in 2012. In three of these races — Montana, South Dakota and West Virginia — we perceive a clear Republican edge, and have for months. Meanwhile, there are three others — Alaska, Louisiana and North Carolina — that we have seen as Toss-ups for months, and close polls in all three states confirm that view. With a Leans Republican rating, we had Arkansas lumped in with the first group, but it really belongs with the second group. Our most recent Senate ratings are shown in Map 1 below. The calculated takeaway is this: As of now, Democrats are clear underdogs in the two states where they want to play offense. They also are probably no better than 50-50 in any of the seven red states where they are defending seats, and drowning in a couple. A big enough wave could cut into the blue states, too, although probably not as deeply as Republicans fantasize. Put it all together, and the current forecast calls for a wave that’s more than a ripple but less than a tsunami — a four to eight-seat addition for the Republicans, with the higher end of the range being a shade likelier than the lower. So much for “Sid-mentum.” Last week, we mentioned that there was some buzz surrounding the candidacy of banker Sid Dinsdale (R) in the GOP Senate primary in Nebraska. Dinsdale did in fact finish second, ahead of ex-state Treasurer Shane Osborn (R), but Midland University President Ben Sasse (R) ended up crushing both major opponents, garnering nearly 50% of the vote. Sasse is as good as elected to Nebraska’s open Senate seat, and his win gave outside conservative groups like the Club for Growth and the Senate Conservatives Fund reason to cheer. In the state’s highly competitive GOP gubernatorial primary, 2006 Senate nominee Pete Ricketts (R) narrowly defeated Attorney General Jon Bruning (R), who readers will remember from his unsuccessful Senate bid two years ago. Ricketts also has a failed Senate contest on his ledger, having lost the 2006 general election to former Sen. Ben Nelson (D). But in this race he starts as a heavy favorite against Chuck Hassebrook (D), former director of the Center for Rural Affairs. Rep. Lee Terry (R, NE-2), who often has tough races, only beat an unheralded primary challenger with a middling 53% of the vote. Still, after the primaries in Nebraska and West Virginia on Tuesday, no incumbent member of the House or Senate who has sought renomination has been denied it. In the Mountain State, Rep. Shelley Moore Capito (R, WV-2) and West Virginia Secretary of State Natalie Tennant (D) easily won their respective primaries. Capito is favored to become the first Republican in more than a half century to win a Senate race in West Virginia, but regardless of who wins, the state will elect its first woman to the Senate. Next week features six primaries and a lot of notable races. In Georgia, none of the Republican Senate candidates is likely to clear the 50% threshold to avoid a runoff. Businessman David Perdue (R) has led all recent polling, with Rep. Jack Kingston (R, GA-1) and former Secretary of State Karen Handel (R) fighting for second place. The key point here is that outspoken social conservative Reps. Paul Broun (R, GA-10) and Phil Gingrey (R, GA-11) consistently lag in fourth and fifth place. These are the candidates that likely Democratic nominee Michelle Nunn would prefer to face. One House incumbent to watch here is Rep. Hank Johnson (D, GA-4) in a heavily Democratic seat. He faces a stern challenge from former DeKalb County Sheriff Tom Brown (D). For all the talk of primary challenges to Republican incumbents, the first incumbent to lose a primary this year might be a Democrat. In Kentucky, there’s no indication that Senate Minority Leader Mitch McConnell (R) has much to worry about in his primary against Tea Partier Matt Bevin (R), and to the east, in Pennsylvania, all polls show businessman Tom Wolf (D) with a big lead in the Democratic gubernatorial primary. Assuming he wins, Wolf will start as a favorite against unpopular incumbent Gov. Tom Corbett (R). To the west, dark horse Republican Senate contender and physician Monica Wehby will first have to win her Oregon primary, and Rep. Mike Simpson (R, ID-2), despite attacks from groups like the Club for Growth, is favored in his primary. Finally, Arkansas will hold its primary: The only real action appears to be Republican primaries for open House seats AR-2 and AR-4. 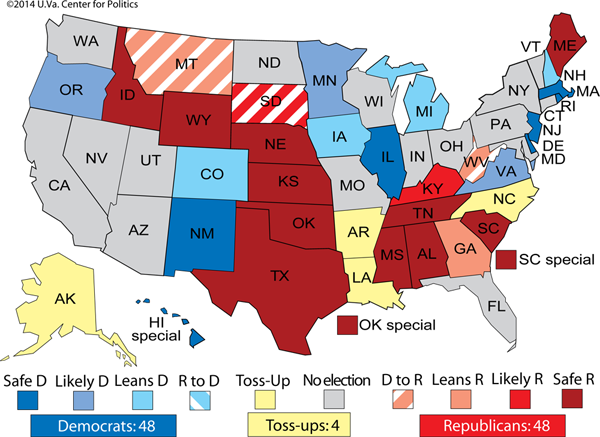 The GOP is favored to hold both seats, but they could be competitive in the fall. Jany quickly showed he wasn’t ready for primetime — the Tampa Bay Times found holes in his educational background — and he abandoned the race on Tuesday. So Democrats don’t have a candidate here, moving a potentially competitive district from Leans Republican to Safe Republican. With the switch, 10 of the 17 Republican-held districts won by President Obama are rated as either Likely or Safe Republican (the others are more competitive). That’s just another reason why the likeliest outcome in the House is for the GOP to add a small number of seats to its majority.